The Epson range of inkjet printers contains models to suit every user, from the small volume home desktop to the busiest office. All offer unrivalled image clarity and colour quality. Most people are unaware that true colour images reproduced by the Epson printer range are not photographs, until you tell them ! This gives you plenty of scope in choosing the ideal printed output and print quality that you require. Please see the media price guide below for a full details of sizes and prices of the extensive range available. Unlike the competitors, PHOTO QUALITY printing is STANDARD on ALL Epson colour inkjet printers. There is no requirement for add - on inks, heads or special kits. The supplied Epson Printer drivers feature a unique background spooling system which offers far faster return to application after calling a print function. The result is less computer time consumed waiting for a print job to complete, and more computer time for productive work. The printer driver also optimises printing to ensure maximum image quality at all times. 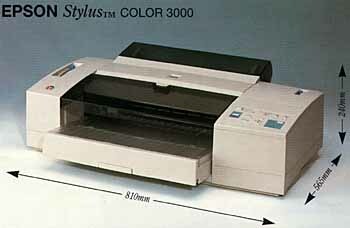 The range of A4 printers starts with the Stylus Colour 300 . This model is the ideal choice for the low volume home user environment. It offers 720 x 360 dpi output at a budget price. Ink replenishment is accomplished with the simple replacement of a single all in one ink cartridge. The Stylus Colour 440 improves the resolution to 720 x 720 dpi. A separate black ink cartridge enables economical monochrome printing. The Stylus Colour 640 advances to the amazing level of 1440 x 720 dpi. This resolution results in much improved quality of graphics, particularly high resolution line art. The Stylus Colour 740 and Stylus Colour 850 are the perfect choice as a networked colour printer in a busy office. They provide the exact same print quality as the Stylus Colour 640, but with an advanced print head and paper feed mechanism which operates at nearly double the speed ! The top of the line Stylus Colour 900 offers up 12 page per minute A4 output, with the same quality as all other Epson colour printers. It is the ideal choice for a large corporation with extensive colour printing requirements. The Stylus Photo 700 is a second generation photo quality printer specifically optimised to printing of true colour photographic reproductions. It's unique 6 colour CcMmYK (Cyan, Light Cyan, Magenta, Light Magenta, Yellow, Black) ink system and AcuPhoto HalftoningTM system ensures vastly improved half tone abilities particularly in critical areas like skin tones. The printed output from a Stylus Photo 700 challenges photographic print techniques in result. The Stylus Photo 1200 is the latest development in photo quality image printing. With the addition of "Microdot" technology, images surpassing all but the best pre - press printing devices is obtained, with media sizes up to A3+ (A3 with full bleed). The Stylus Colour 3000 handles the full width of A2 media, banner roll paper, canvas cloth roll and tractor feed papers, again with 1440 x 720 dpi CMYK quality. A consequence of printing large media sizes is substantial ink usage. This model utilises separate ink cartridges for each colour, minimising operating costs and reducing ink waste. An optional warranty extension programme, backed by Epson Australia, extends all new printer warranties from the standard one year to three years, for added peace of mind. Contact ZCM Services for pricing and details. A $12.00 delivery fee is payable for consumable and media orders not purchased with a new printer. Copyright ©1997 ZCM Services, Australia. Last updated on April 30, 1999.